Although Spring signals the beginning of my all-time favorite Patio Dining Season, Fall brings me home. I don’t mean inside my home (although it does that, too), I mean thoughts of home ... being comfy and cozy with family, friends--and of course, food! Fall food is the stuff that makes you warm inside, brings back memories and makes you want to take a nap in front of the fireplace afterward. There’s a little gem we have frequented for years, but we just recently discovered their donuts. Jacquemin Farms offers warm (if you time it right) sugar coated pumpkin donuts - grab one before you hop on the hay wagon to go out to the fields to pick your pumpkins. La Chatelaine’s Cream of Tomato Basil Soup. (Don’t skip the croutons and cheese!) The bake ry atmosphere and warm cozy dining room with the stone fireplace make it the perfect place to be on a Fall day. I have to admit to eating this in the Spring on their patio, too. They say appetizer, I say entrée. To each his own. 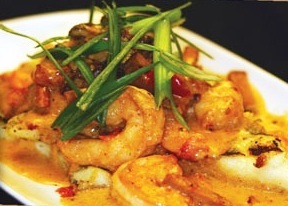 Matt the Millers Shrimp and Grits are absolutely crave-able. Just writing about them makes me want to jump in my car and go. An age old way to warm up: Bravo Cucina Italiana offers hot Apple Cider with Captain Morgan Spiced Rum--and a new trendier way--their Apple Cider Martini. They also offer a seasonal Pumpkin Crème brûlée. It’s hard to improve on the traditional kind, but it is Fall after all. Sunny Street Cafe’s Pumpkin Pancakes. Think sweet cream sauce and butter with walnuts and cinnamon to top it off. Breakfast and dessert have always been interchangeable in my mind anyway! A Featured Dish for the chilly months at Kogen&apos;s is called Beef Pho. (This is pronounced Beef Fuh--as in ... "Uh, let me think about that.") 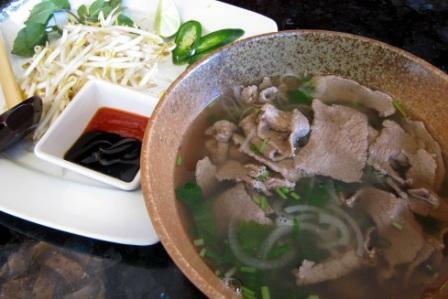 Traditional Vietnamese Pho (Beef Noodle Soup) is a hearty soup of Beef simmered for more than 8 hours with onions and spices. 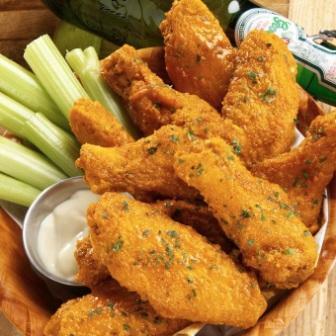 It is served with a side of vegetables and sauces that can be combined to create a custom flavor. The Morgan House serves warm Kendra&apos;s Creamy Chicken Pot Pie. It’s topped with puff pastry and served in a fun terra-cotta pot. The hot mulled cider is very nice, too. Something fancy? 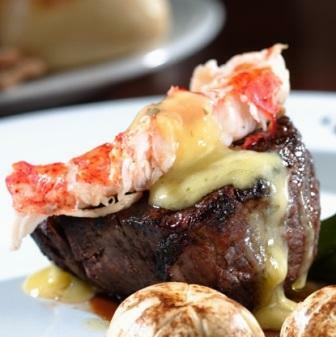 Although you can get it year-round, Hyde Park Prime Steakhouse will warm you up with their Steak Kosar. It is a 7 oz. or 10 oz. filet mignon over bordelaise crowned with lobster and bearnaise; asparagus and mushroom caps. What is Fall without Mac-n-Cheese? And NOT the boxed kind. Homemade style Mac-n-Cheese. Hoggy&apos;s Mac-n-Cheese is made-from-scratch and finished under the broiler so the top is slightly browned and crispy, but the inside is smooth and creamy. In my picky family, the kids don’t like &apos;the brown stuff’. Lucky for me, I do! Yum! Did Scotland invent comfort food? It seems like everything on Digger & Finch&apos;s menu says “come on in and get comfy.” The two standouts for me are the Guinness Stout and Cheddar Soup and Scotland Yard’s Shepherd’s Pie. The pie is made with ground chuck, lamb and pork simmered in cabernet, with carrots, onions and peas baked in a cheddar potato crust. You can start your diet tomorrow! Just in time for Fall, Rusty Bucket has added some new menu items including three new wing sauces--mild with teriyaki, spicy with sriracha sauce and chipotle in the middle. They also have added some new comfort foods including Short Ribs, Sloppy-Joes, Pork Wing Tacos and Shrimp Grilled Cheese. Traditional Fall comfort food, maybe not, but Gooseneck Tavern has added a few new ‘spicy’ dishes to their menu that are sure to warm you up. Boom Boom Shrimp, Willow Noodles, and Grilled Andouille Sausage and Shrimp all have a bit of a kick! I haven’t found my favorite place to get chili--which is almost the very definition of comfort food. Well, I have, but my mom doesn’t own a restaurant. There are so many great restaurants in and around Dublin that I could go on for a while here. And surely I haven’t been to them all. Do you have a favorite Fall restaurant dish? For more ideas, visit the extensive list of Dublin Ohio restaurant listings here.